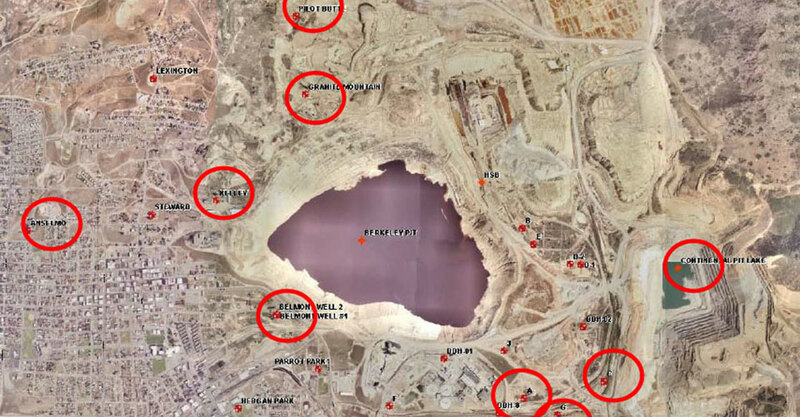 Monitoring compliance points in the Berkeley Pit groundwater system. The water level a each point is monitored monthly by the Montana Bureau of Mines & Geology. When the water at any compliance point reaches the Critical Level (5,410 feet above sea level), pumping and treating of Berkeley Pit water will begin to prevent contaminated water in the Pit and groundwater system from spreading outward. Image from the Montana Bureau of Mines & Geology.